Looking for a discount on cruise parking? What about a promo code to save a few extra bucks? You’re in luck. Galveston is by far the best port in the country when it comes to cheap parking. Because of the port’s location in an industrial area, there are several lots in the immediate area. The high amount of competition keeps rates low. Parking for a 7-day cruise can run as little as $50. But that’s before you add in any coupons. We’ve found some lots that can offer some big discounts — up to $15 off a one-week cruise in some places plus many ways to qualify for 10% off the total bill. The best way to get a discount on your parking is simple — reserve online ahead of time. Nearly all of the cruise parking lots on the island, including the official Port of Galveston lots, offer a discount for advance reservations. Usually this discount is $5 for a 7-day cruise. More importantly, reservations ensure you’ll have a parking spot on cruise day, instead of fighting to find a place to park. Reserved spots usually have to be paid for in advance. If you are uncomfortable paying online in advance, just know that your cruise day parking will run a little more. Not many parking lots offer promo codes for discounted parking, however, EZ Cruise Parking does. If you plan to park there, we recommend signing up for their email list (there’s a link at the bottom of their website). The company will send you occasional coupon codes good for $5-10 off of parking. These codes change monthly and are sent via email to those subscribed to the email list. At this time, we are unaware of any paper coupons for Galveston cruise parking. Whether you find a paper coupon or an online discount, some lots, including Lighthouse Parking, will honor competitor’s coupons. It never hurts to ask if they will honor a competitor’s rate. One of the biggest costs for parking lots is running the shuttle between the lot and the cruise terminal. The port charges parking lots for access to drop off passengers. The fewer trips a parking lot makes with the shuttle, the lower their costs of business are. Some lots have started to offer a discount to customers who skip the shuttle and walk to the port. These “Park & Walk” discounts can be major money savers. EZ Cruise Parking is now offering a whopping $15 off of parking for those people parking for a 7-day cruise and who decide to walk to the terminal, which is a short distance. You can get this deal using the coupon code “20parkwalk” if you are taking a 7-day cruise. If you are on a shorter cruise, you can use “15parkwalk” for a 4-5 day cruise to save $15. Update: EZ Cruise Parking no longer requires a coupon code. You can now simply book your spot and choose whether you want to take the shuttle or walk to get the discounted rate. 81st Dolphin Parking also has a Park & Walk discount. There’s no coupon code for this deal, you simply select the “Park ‘N’ Walk” option when reserving your space. This deal saves you $10 off parking for a 7-day cruise ($45 versus $55) and $5 off parking for five days or less. Update: 81st Dolphin Parking no longer mentions a Park & Walk rate. All rates now include shuttle service to the port. Are you in the military, medical industry, teaching industry, first responder, or a senior citizen? Then you can save 10% off of rates with EZ Cruise Parking. To qualify, you’ll need to join the company’s Customer Loyalty Program. From there, submit proof that you qualify for one of these groups and you’ll receive your discount. If you are planning to stay in Galveston before or after your cruise, then see our list of hotels offering free or discounted cruise parking to save even more. 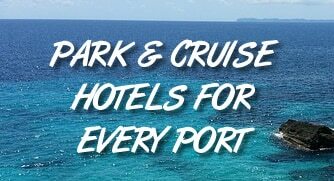 These deals allow you to park at the hotel as long as you stay at least one night with them before or after your cruise. Know of any other cruise parking coupons, discounts, or promo codes? Tell us about them in the comments. Is there any promo code for a 5 day?